I don’t make fish often because it tends to be on the expensive side, but I’ve really been craving it lately. Add to that my continued efforts to try to buy higher quality and sustainable meat and seafood, and my price tag just got even higher. So, what did I do? I paired my fish with two super inexpensive items: rice and cabbage. It’s all about balancing those higher priced items with bulkier low cost items. 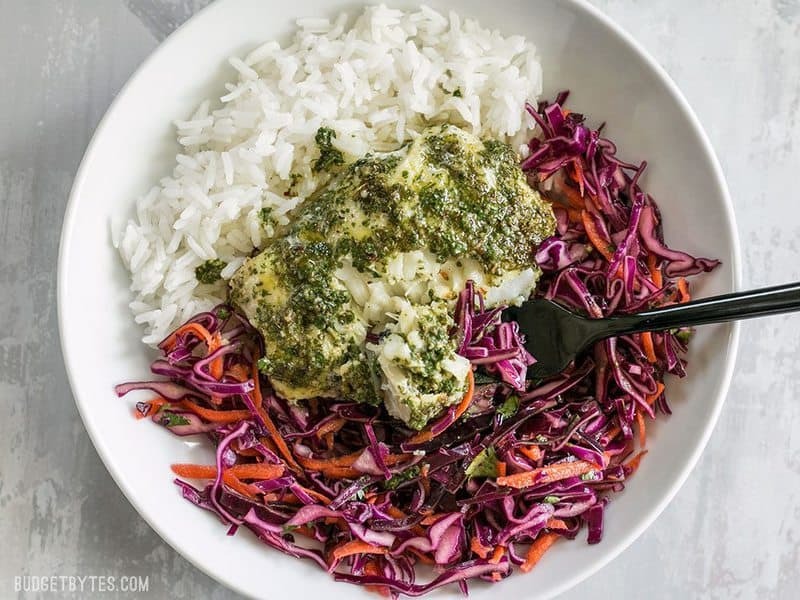 This easy Baked Chimichurri Fish Bowls include a rice base, a big pile of simple red cabbage slaw, and cod filets baked in a vibrant chimichurri sauce. 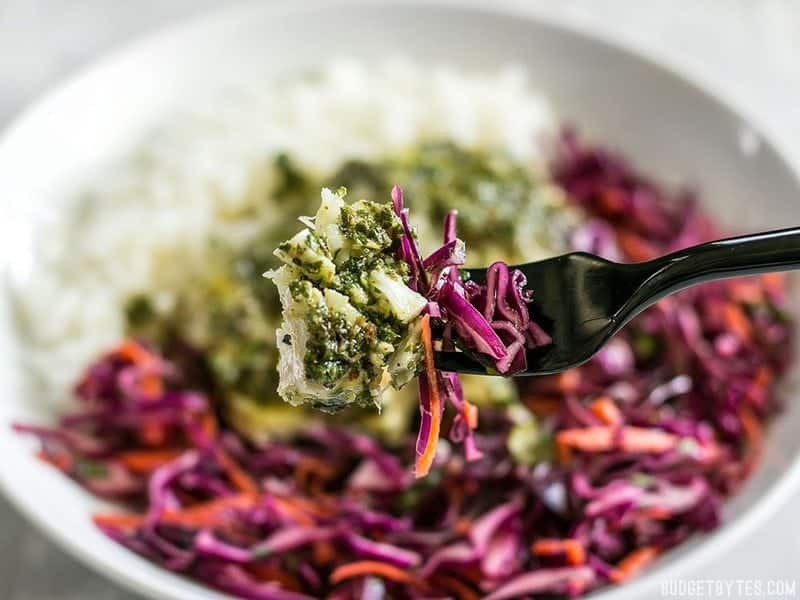 Any extra chimichurri gets drizzled over top to make sure every bowl is moist and delicious! You can use any white fish for these bowls, but just be aware that thinner filets will cook much faster. I used thick cod steaks that were about 1-1.5 inches thick. As they are also the most expensive item in the dish, your overall cost will depend greatly on whether you can get a good deal on your fish. As I mentioned earlier, I opted for sustainable rather than budget this time around, so my total cost was a bit higher than usual. Should Baked Chimichurri Fish Bowls be Served Hot or Cold? When I ate these bowls the “day of” the rice was warm, slaw was cold, and the fish warm. I packed them up into individual containers and will be eating the leftovers as a cold dish. 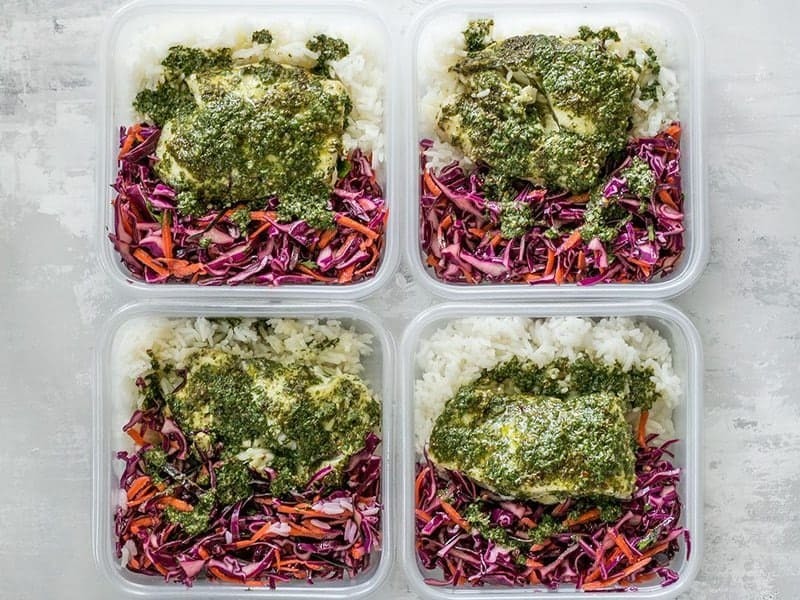 These light and fresh Baked Chimichurri Fish Bowls are simple to prepare and make great cold lunches for the rest of the week. 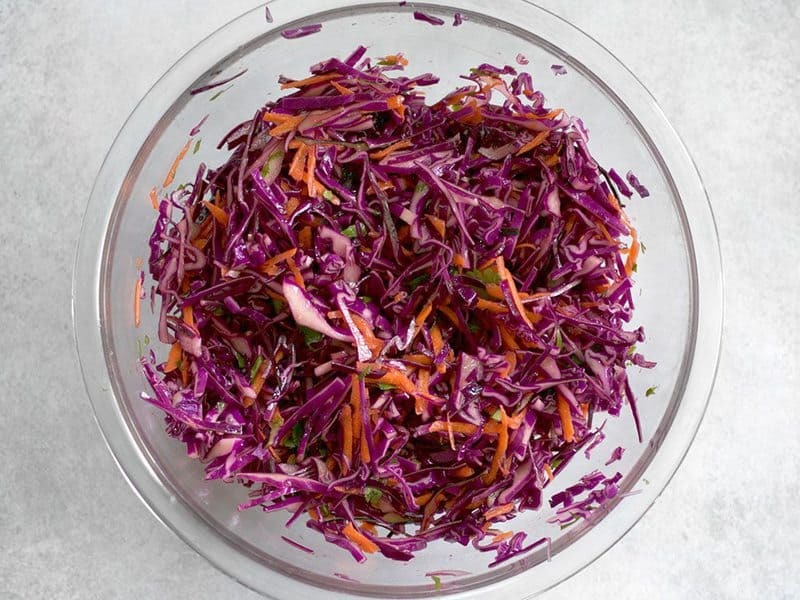 Prepare the slaw first so that the salt and lemon juice have time to soften the cabbage. Slice or shred the cabbage as thinly as possible (this is very important). Use a large-holed cheese grater to shred the carrot. Roughly chop a handful of cilantro leaves. 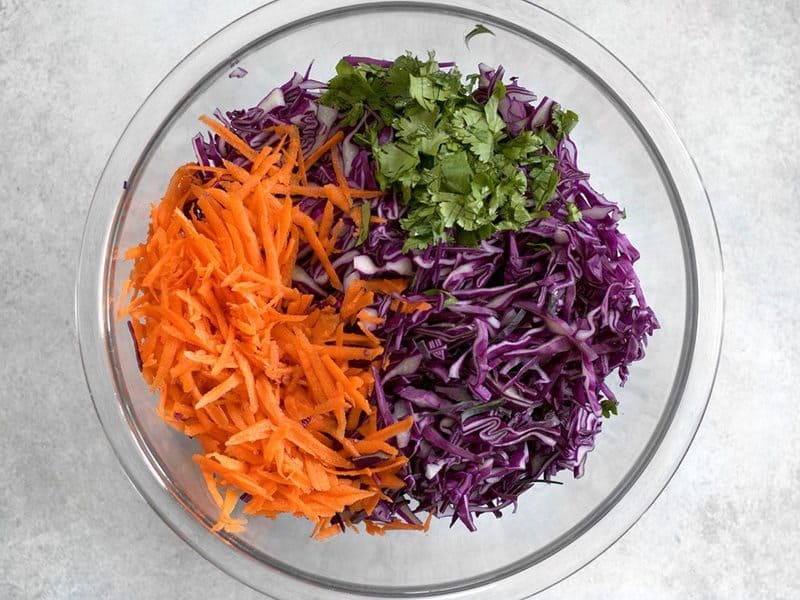 Combine the cabbage, carrot, cilantro, lemon juice, oil, and salt in a bowl. Stir to combine. Let the cabbage sit for at least 30 minutes to soften, stirring occasionally. Combine all the ingredients for the chimichurri in a food processor or blender and pulse until the herbs are finely chopped. Alternately, you can mince the garlic, parsley, and cilantro with a knife and then stir them together with the remaining ingredients. Begin preheating the oven to 400ºF. 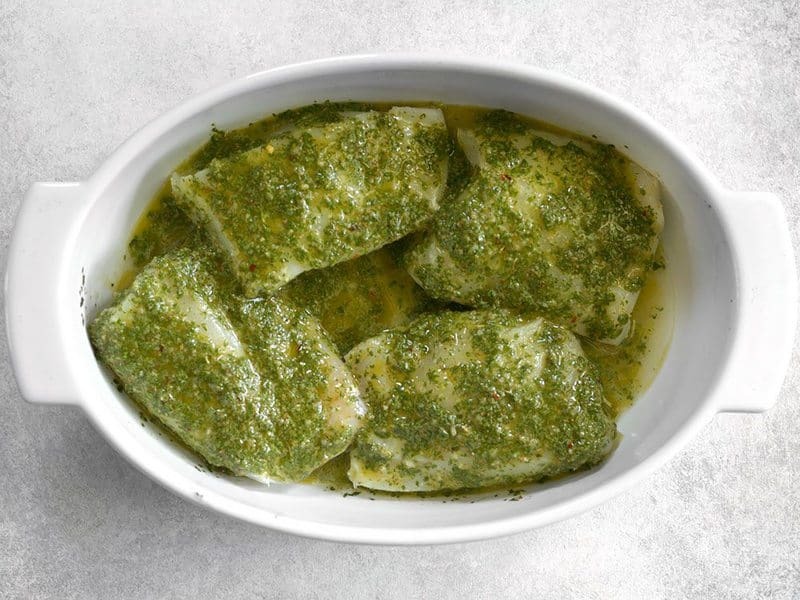 Place the cod steaks in a baking dish. Spoon half of the chimichurri over top, reserving the other half for drizzling over the bowls after baking. Bake the fish for 12-15 minutes, or until it is cooked through (the fish should flake when a fork is inserted, but still be moist). 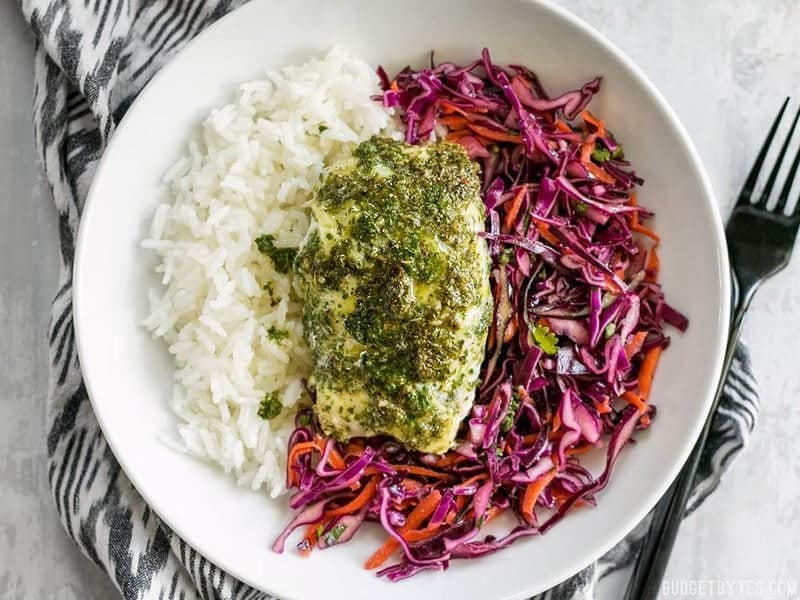 To build the bowls, place one cup cooked rice in a bowl, top with a heaping cup of the slaw (make sure to stir just before serving), and then place the baked fish on top. 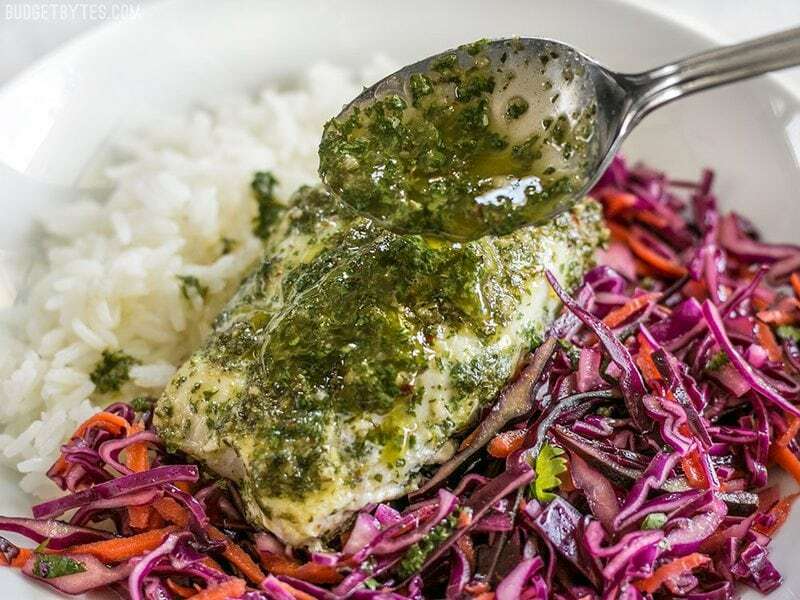 Drizzle some of the remaining chimichurri over the entire bowl and enjoy! Prepare the simple slaw first so that the salt and lemon juice have time to tenderize the cabbage. Shred or slice 1/2 head of cabbage as thinly as possible (if you have a food processor or mandolin, those will get you nice super fine shreds). Use a large-holed cheese grater to grate one carrot, and roughly chop a handful of fresh cilantro. Place the cabbage, carrot, and cilantro in a large bowl. Add 2 Tbsp lemon or lime juice, 1 Tbsp neutral oil (like canola or your favorite light oil), and 1/2 tsp salt. Stir to combine. Let the mixture sit for at least 30 minutes to soften, stirring it occasionally to redistribute the salt and juices. Next, prepare the chimichurri. Place 1/2 cup olive oil, 1/4 cup red wine vinegar, about 1 cup packed Italian parsley leaves, 1/2 cup packed cilantro leaves, 3 cloves of garlic (peeled), 1 tsp dried oregano, 1/2 tsp cumin, 1/4 tsp red pepper flakes, and 1/2 tsp salt in a blender or food processor. Pulse until the garlic and herbs are finely chopped and the mixture looks like a green sauce. Begin Preheating the oven to 400ºF. 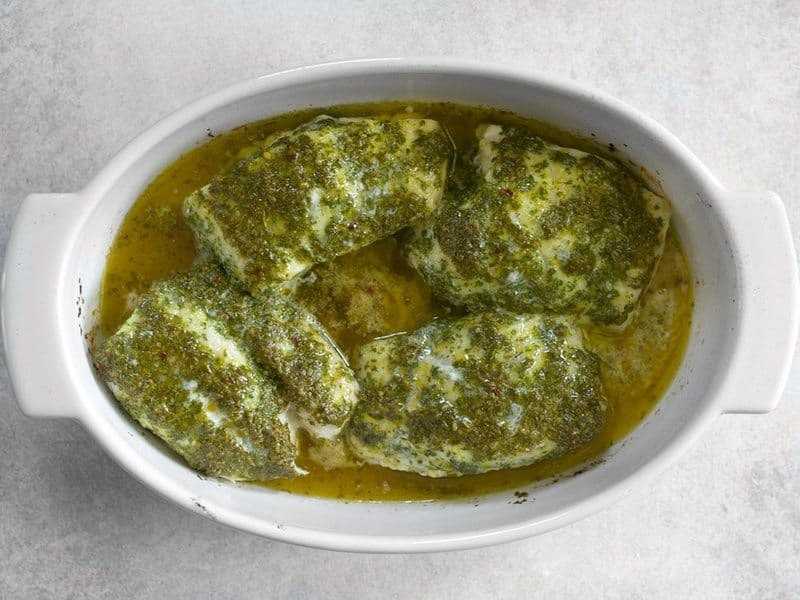 Place four cod steaks in a baking dish. 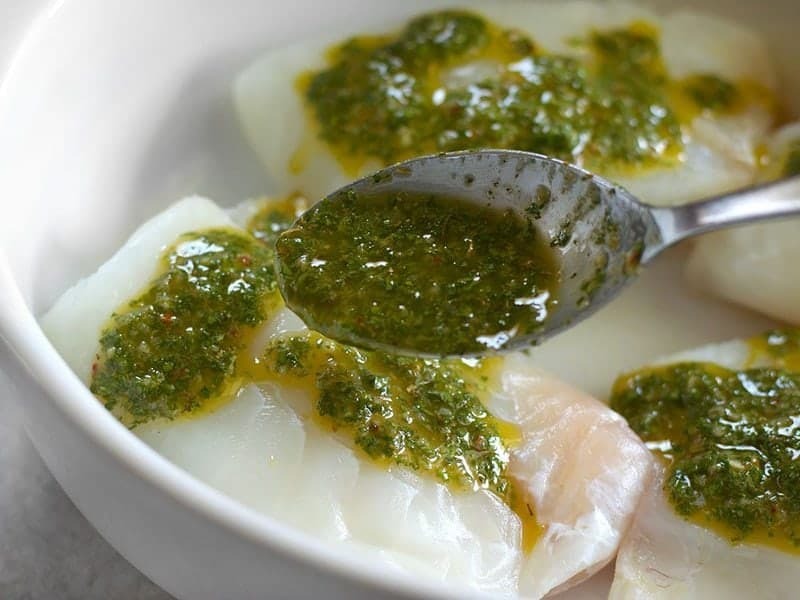 Cover the cod in half of the chimichurri sauce, saving the rest to drizzle over the completed bowls. 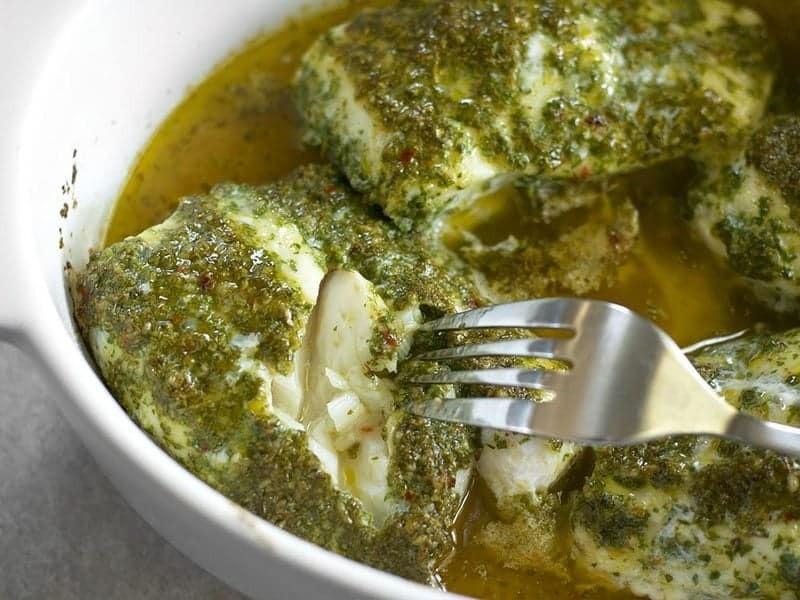 Make sure the cod is completely coated in the chimichurri. Bake for 12-15 minutes, depending on the thickness of the fish, or until the fish flakes but is still moist. When you pull at the fish with a fork, it should flake into large moist pieces. 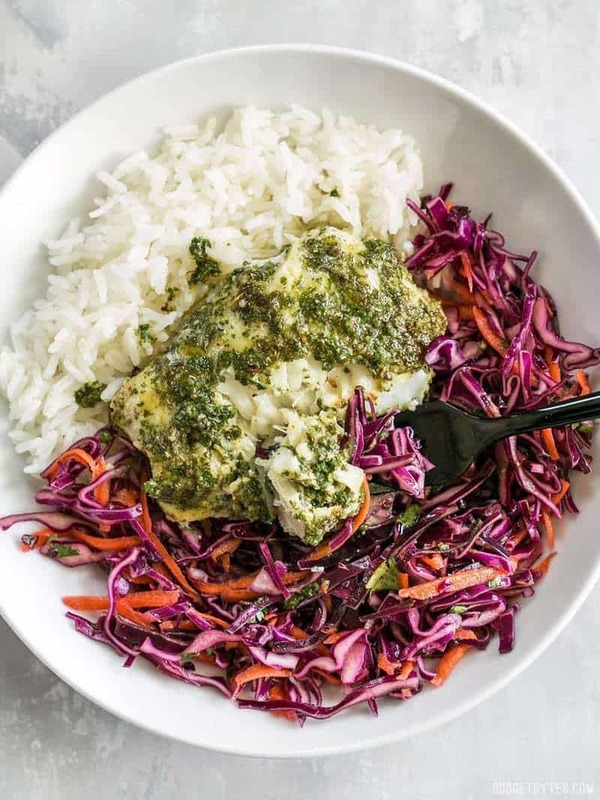 To build the bowls, place one cup cooked rice in the bottom of a bowl, add one heaping cup of the simple slaw, then top with one of the pieces of chimichurri baked fish. Drizzle the remaining chimichurri over top. I packed these up as meal prep bowls for the next few days. Although the fish and rice were warm when I ate the first one, I’ll be eating the leftovers as a cold dish. Fressssshhhhhh! And you might not guess it by looking at it, but these Baked Chimichurri Fish Bowls are EXTREMELY filling. Win! This has to be one of the best recipes you’ve ever published, Beth. It’s excellent as-is, and I’ve made it easily half a dozen times in the last year. The coleslaw works very well with green cabbage, and especially with a splash of white wine vinegar. Tilapia instead of cod is also great, and around here it’s a bit cheaper. Seriously, 10/10. It’s easy to make two or three times this recipe to feed large groups, and it is without fail an absolute hit. Seriously one of my favorite recipes EVER! Have made it frequently and tried it out on many guests with praise! Hi Beth! I love your recipes and helpful pictures. This is one of my favorites!!! I make it with tilapia. The sauce is so yummy. My family loves it! Thank you. I made this last night. I liked it but the rest of my family didn’t care for it much. It was just okay for us. Hi Beth! Since now I’m an official WWBC (what would Beth cook) believer, I’m excited to try all of these! Would this hold up for a week’s worth of lunches? I’m totally fine with freezing the fish and leaving it to defrost the night prior for the Thursday/Friday meal, but would the sauce and slaw hold up? Isn’t canola oil processed oil? Olive & coconut oils would fit the 21 day diet & the 20/80 maintenance menu.